Sleek high ponytails, polished skin and glossy red lips offset bold black ribbon bangs at Tavan & Mitto. 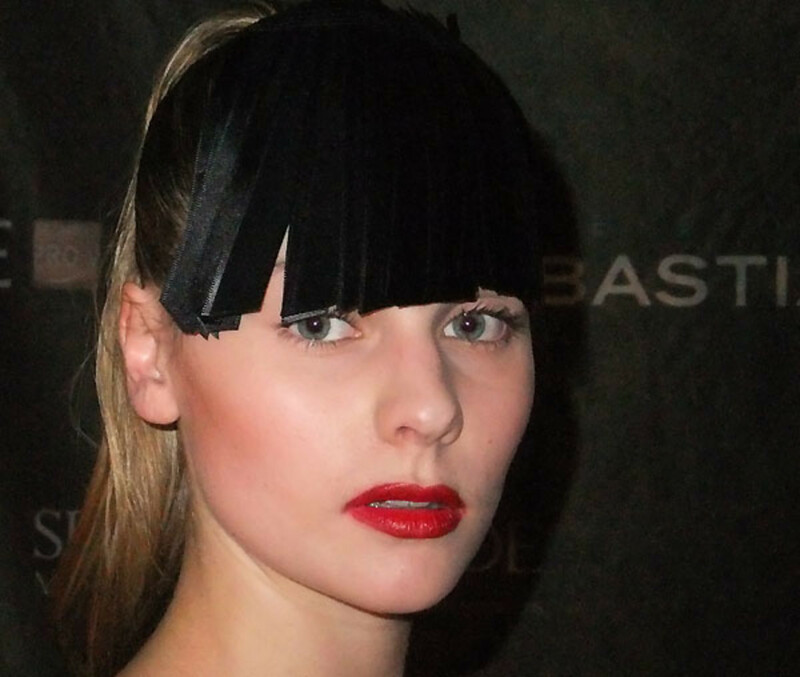 Make your own black ribbon bangs? 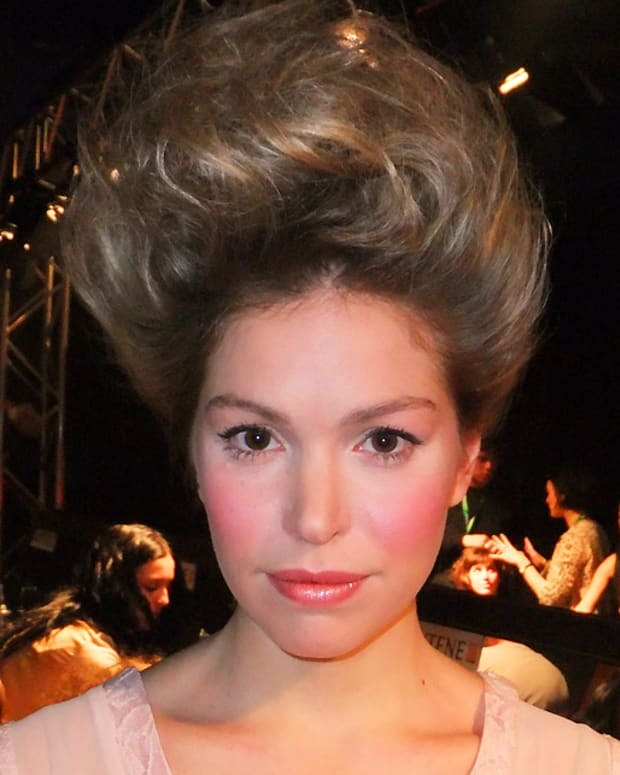 I&apos;m at Montreal Fashion Week for the next few days, checking out the Fall/Winter 2012 runway looks by CoverGirl and Pantene for Quebec-based Canadian designers such as Marie Saint Pierre, Melissa Nepton, Eve Gravel and Rud by Rudsak. Last night at Tavan & Mitto, I was struck by clip-on bangs not made by Jessica Simpson&apos;s mane bestie, Ken Paves. 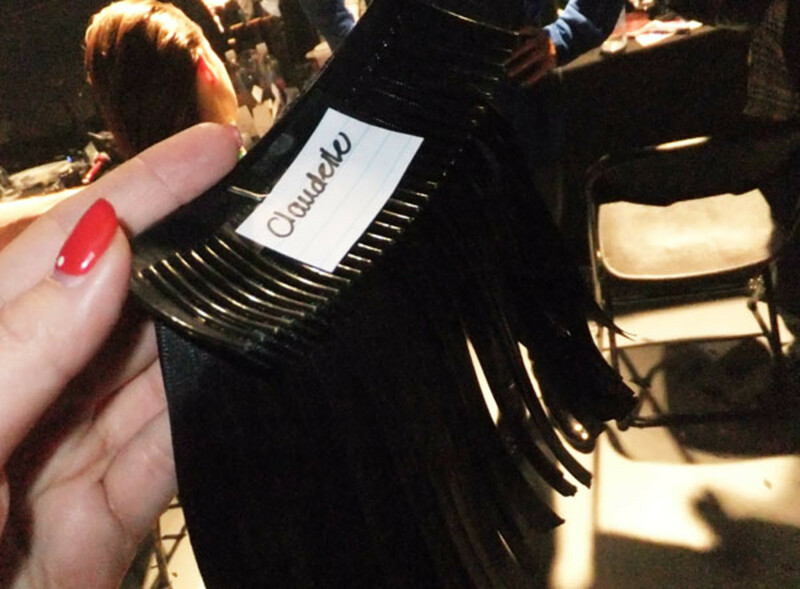 "Azamit, the stylist for Tavan & Mitto, wears these pieces out regularly," explained Denis Binet, the chief hair stylist for Montreal Fashion Week and Pantene/Clairol Quebec consultant. 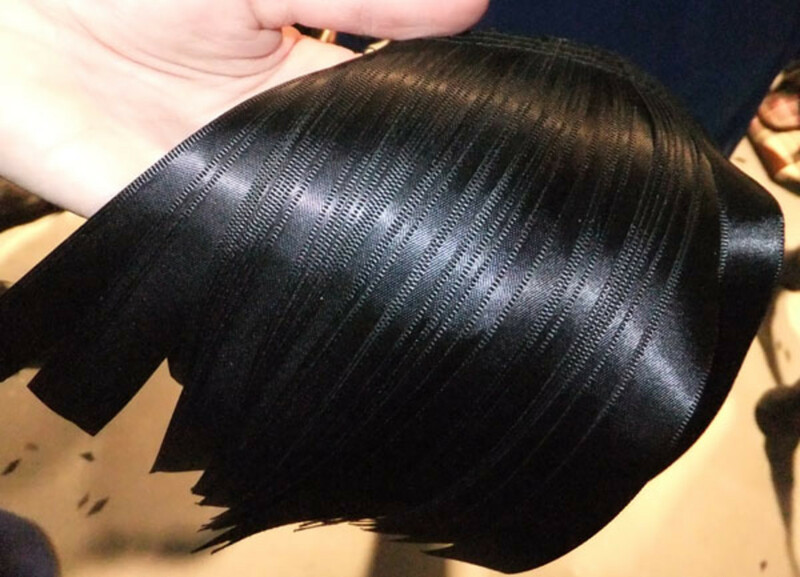 Technically, the dense fringe of black ribbon strips didn&apos;t clip on -- it attached via hair comb. Every model wore black, no matter her hair colour. 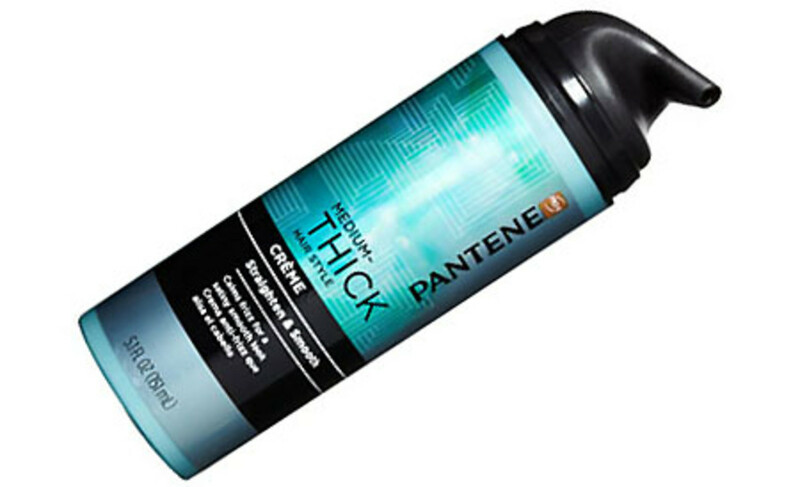 To offset the accessory, Binet loaded each model&apos;s hair with Pantene Classic Total Control Gel and Pantene Medium-Thick Hairstyle Creme to make the hair easier to smooth back into a sleek, high ponytail. "The creme makes the finish less crispy," he said. Amelie Ducharme, chief makeup artist and Covergirl Quebec consultant, balanced the big-bang drama with polished skin and glossy true-red lips. 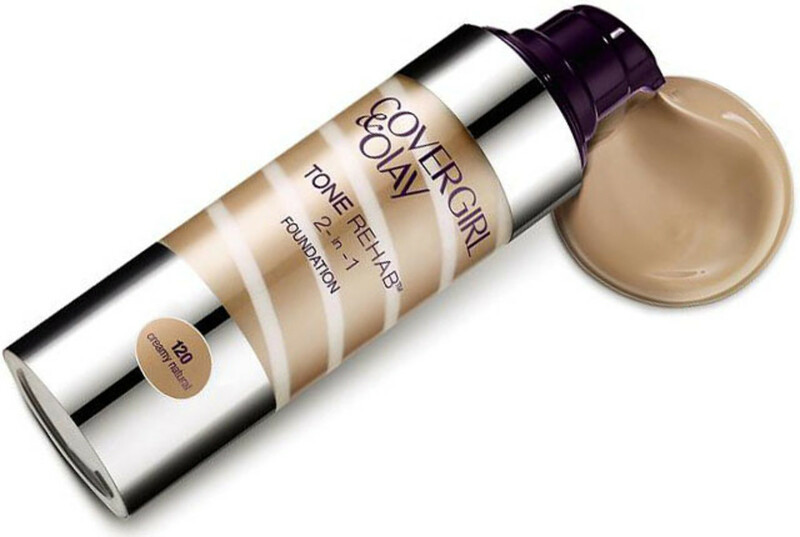 The team of artists used Covergirl & Olay Tone Rehab 2-in-1 Foundation topped with Covergirl Clean Pressed Powder to even out model complexions. On lips, they layered lipstick then liner then lipstick again using Covergirl Lip Perfection Lipstick in #305 Hot and Lip Perfection Liner in #200 Sublime, and finished with a slick of clear Covergirl Shineblast Lipgloss. "We haven&apos;t seen a lot of gloss lately," she said. "We brought it back to complement the mix of structure and flow, texture (wool, sequins) and colours (saffron, navy, copper) in the Tavan & Mitto collection." Love the lip. What do you think of the bangs?